One morning I woke up nowhere. It was a really noisy nowhere. Outside the window of my clean, brand-new hotel room, a muezzin was singing the call to prayer over a loudspeaker. Trucks and cars were honking in the street below, and the sound of jackhammers and bulldozers from half a dozen construction sites showed that nowhere was building up fast. I was in Hargeisa, the capital of Somaliland, a country on the Red Sea in East Africa recognized by no other nation in the world. above: At the center of Hargeisa stands this defiant independence memorial showing the people of Somaliland declaring independence despite deadly bombing from the government in Mogadishu. The countryside is littered with the wreckage of past wars. Somaliland emerged from the northern part of Somalia during the 1991 civil war, a bitter conflict of clans fighting clans that continues in southern Somalia. In between Somaliland and Somalia proper is the Horn of Africa, a region that is now the unrecognized nation called Puntland, infamous for being a safe haven for pirates. In contrast to these two forms of chaos, Somaliland has a functioning government, the rule of law, a viable if precarious economy, and held free and fair elections in 2010. It’s also open to tourism, although there are few facilities for visitors outside of Hargeisa. Somaliland is not a sightseeing destination. There are no museums and few places of historic interest that have survived the ravages of war. It is the country and culture itself that are worthy of a visit. These trucks brave the wild route to Mogadishu to trade. While they have to pay protection money to each local clan and Al Shabab, good money can still be made on this run. The Somalis are traditionally a culture of herders, and even in the capital livestock rule the streets. Somali culture is traditionally based on the clan system, with many people still living semi-nomadic lives herding camels, goats, and other livestock in the arid region. Animal exports are an important part of the economy, as is money coming in from Somalis living abroad. Many of these expats, seeing how Somaliland has stabilized over the past two decades, have returned to invest in the local economy. Businesses and hotels are springing up everywhere and the two main cities, Hargeisa and the port of Berbera, are undergoing a construction boom. 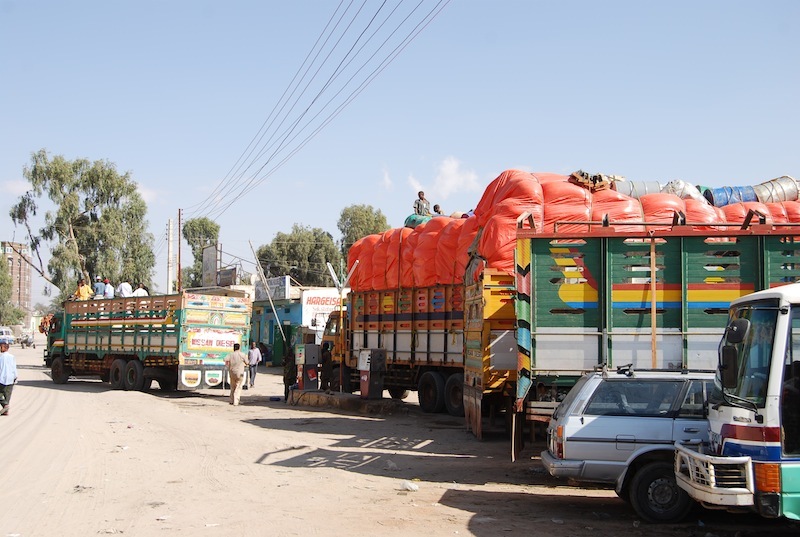 The port is also a vital source of income, being the main shipping outlet for neighboring Ethiopia. An Indian supermarket in Hargeisa. Entrepreneurs have come from all over the world to set up shop in Somaliland. Most of them go to Hargeisa and there’s a noticeable income disparity between the capital and the rest of the country. Money is pouring into infrastructure. A few years ago, the drive from Ethiopia to Hargeisa was a grueling ten-hour ordeal over roads that turned from bad to nonexistent. Now most of the way is paved, cutting travel time nearly in half. There’s also a good road between Hargeisa and Berbera. The rest of the country is lagging behind and many places are only accessible with off-road vehicles or on the back of a camel. In the cities and towns, there are still many ruined buildings, their walls pockmarked by bullets. In Berbera, the rusted hulks of several sunken ships poke out of the water. Most visitors come to Hargeisa first, either overland from Ethiopia or flying into the airport from other East African cities. The town center is all new and crowded with streetside markets, food stands, and colorfully painted trucks bringing in goods from all over East Africa. There is virtually no street crime and visitors are perfectly safe in daylight hours. The Somalis here are sick of war and don’t want trouble. Hurting the wrong person could lead to clan vengeance, setting of a cycle of vendettas and making Somaliland like the rest of Somalia. The joy and bane of Somali culture—qat. This narcotic leaf is both a stimulant and relaxant, similar to taking a small amount of marijuana and cocaine at the same time. Qat chewing is hugely popular among Somalis and is the center of many social gatherings, but it’s a drain on personal finances and long-term use can lead to mental instability. Selling dates in the market. Besides the cheap Chinese imports that are ubiquitous in African markets, vendors sell fresh dates and qat, a narcotic leaf. People fry up piping hot samosas in big pans and restaurants offer tender cuts of camel meat. One of the most common dishes is spaghetti, a legacy of the Italian influence in the region. The Somalis have put their own twist on it by eating it by hand, a trick I was never able to master. Ask for a fork and spoon if you value your clothing. Visitors are few, so Somalis are naturally curious. Expect to answer lots of questions and to be led into people’s schools, workplaces, even the local hospital. Everyone is anxious to show that they have a functioning nation here and the entire country is open to you. Once when I was detained by police due to a misunderstanding I got a tour of the police station! Roadside cafes are popular in Somali towns. The tent in the background is a modernized version of the traditional round hut made of branches and grass. A workshop making artificial limbs. Many refugees flee Somalia and Puntland looking for a better life in Somaliland. There are also unexploded mines in the countryside that kill and maim innocent civilians. While the country does function, it’s not entirely stable. A lingering border dispute with Puntland, plus tensions between the ruling Isaaq clan and minority clans mean that stability is precarious. The government asks that you rent a pair of soldiers if you go outside the capital. While this is annoying, it isn’t overly expensive (about $20/day depending on your bargaining ability) and it does smooth things over at checkpoints. Visitors who flout the request for official bodyguards will often find themselves detained by friendly if insistent police. It pays to play by the rules. 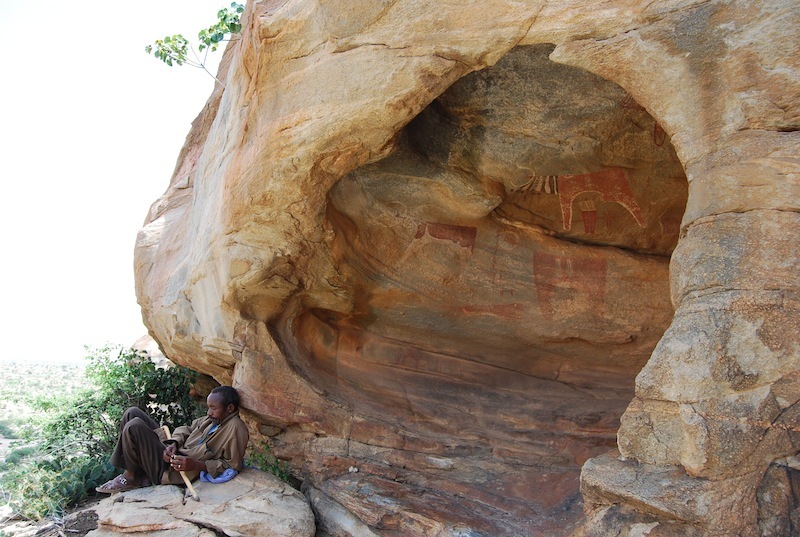 A guide rests by the cave paintings at Laas Geel. Ali, Dr. Mire’s assistant from the Department of Antiquities, describes the cave paintings at Laas Geel. One of the few formal tourist attractions are the beautiful prehistoric painted caves of Laas Geel, halfway between Hargeisa and Berbera and a bit more than an hour’s drive outside the capital. On a rocky outcrop in the desert are nine shallow caves covered with brilliant paintings of cows and people. A few other animals such as antelope and a giraffe appear, but the cows dominate. They’re still an important part of the Somali economy today and this links modern Somalis to their ancient past. The caves were first recorded by Dr. Sada Mire, a Somali archaeologist who runs the site Somali Heritage. It’s hard to date rock art but they may be up to 11,000 years old, making them some of Africa’s oldest paintings. Other estimates place them at about 5,000 years old. Dr. Mire has scoured the countryside and found hundreds of other rock art sites. Hopefully some of these will also become open to visitors. Because Somaliland is an unrecognized state, it isn’t a member of the International Postal Union and therefore mail can’t be delivered there. People have to rely on private courier companies. The abandoned central post office in Hargeisa stands as mute testimony to Somaliland’s lack of recognition. Colorful murals are found all around the Somali region. 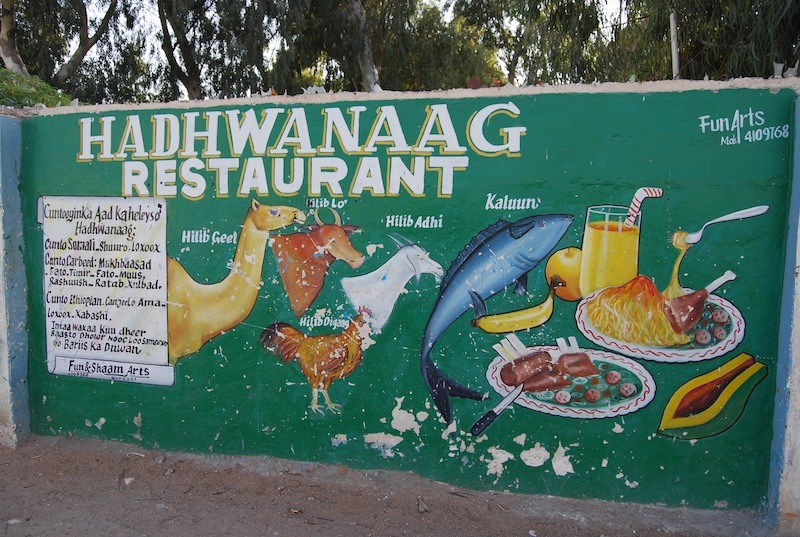 This one advertizes a restaurant and hotel in Hargeisa that serves excellent slow-cooked camel. The port of Berbera has some nice seaside restaurants and a virtually abandoned beach. I’ve heard there’s good scuba diving nearby but have not tried it myself. Somaliland is the best place to experience the rich culture of the Somalis, a culture that embraces change in some ways and proudly holds onto tradition in others. The Somali region in eastern Ethiopia is far less friendly to visitors and has fewer facilities, while the rest of former Somalia is still a no-go area. If you want to learn about Somali culture, Somaliland is the place to be.